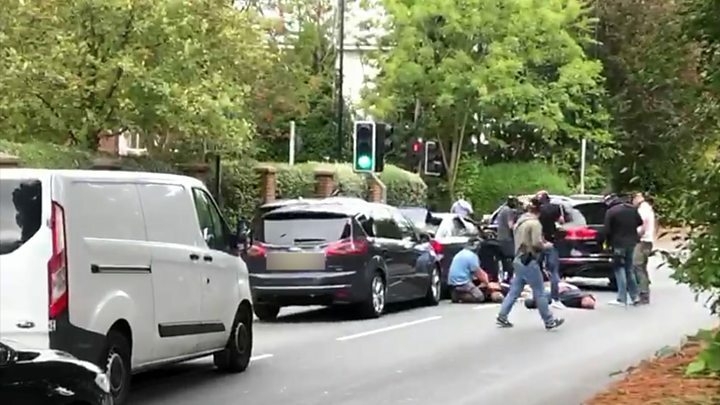 Armed police officers stopped a vehicle and held four men on the ground at gunpoint in Southampton. Unmarked police cars blocked the vehicle carrying the four men in Archers Road at about 11:30 BST. An eyewitness reported officers, mostly in plain clothes, then held them on the ground in the middle of the road. Hampshire Constabulary said the four were all arrested on suspicion of conspiracy to supply drugs and possession of a firearm. The force said it was a pre-planned operation in connection with an ongoing investigation into drugs supply. An eyewitness, who did not want to be named, said: "I didn't know what it was to start with, I just heard some cars, then a police dog going crazy, then people yelling 'get on the ground'. "The armed officers put their masks on after they burst out their cars and got the guys on the floor. "The first thought was terrorism because of the armed response. The men's car was left in the road with police tape around it." A fifth man was later arrested on suspicion of the same offences following a raid at a house in Newcombe Road in the city.